In this article we present the use of dispersive flies optimisation (DFO) for swarms of particles active on a medialness map – a 2D field representation of shape informed by perception studies. 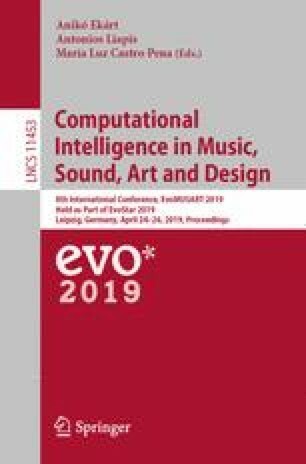 Optimising swarms activity permits to efficiently identify shape-based keypoints to automatically annotate movement and is capable of producing meaningful qualitative descriptions for animation applications. When taken together as a set, these keypoints represent the full body pose of a character in each processed frame. In addition, such keypoints can be used to embody the notion of the Line of Action (LoA), a well known classic technique from the Disney studios used to capture the overall pose of a character to be fleshed out. Keypoints along a medialness ridge are local peaks which are efficiently localised using DFO driven swarms. DFO is optimised in a way so that it does not need to scan every image pixel and always tend to converge at these peaks. A series of experimental trials on different animation characters in movement sequences confirms the promising performance of the optimiser over a simpler, currently-in-use brute-force approach.